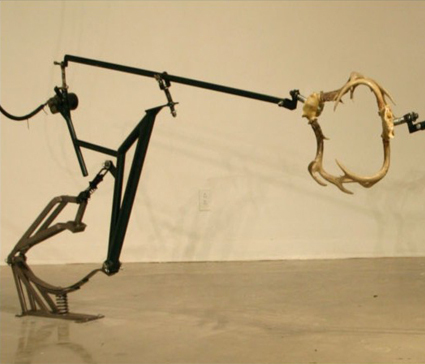 Internationally known artist Brandon Vickerd’s presentation ‘Champions Of Entropy #3’ at Definitely Superior Art Gallery comprises of two fully functioning robotic machines, whose sole purpose is to replicate the organic movements of two male deer locked in constant combat. Purposely diverse, Vickerd’s work is an examination of sculpture as a catalyst for critical thought, enriching the audience’s engagement with the physical world through the creation of spectacle. Vickerd is a professor at York University, Toronto and has an extensive CV. A critically acclaimed artist who has been featured in solo and group exhibitions throughout Canada and Internationally with an upcoming show in New York. You never know what you’ll see downtown! Performative Spring Tour Guides will show you the way to all the exciting Urban Infill locations! Start at Definitely Superior Art Gallery – located at 250 Park Ave. Sat.Mar.31@ 7-10pm with three new exhibitions featuring national /international artists. Pick up your art map, re-discover your north core through art & culture -15 downtown locations – 350 artists, Art / Music / Performance / Refreshments.